It’s difficult to explain how to appreciate Wrong, except to advise audiences to let go of preconceptions and try not to read too much into the film. Perhaps some of the strange goings-on have a deeper, farther reaching meaning, but audiences will probably never be able to definitely figure them out. Furthermore, having meaning would defeat the purpose of absurdist humor. So while aimed at a niche audience, those that fit it will enjoy this fun little movie. 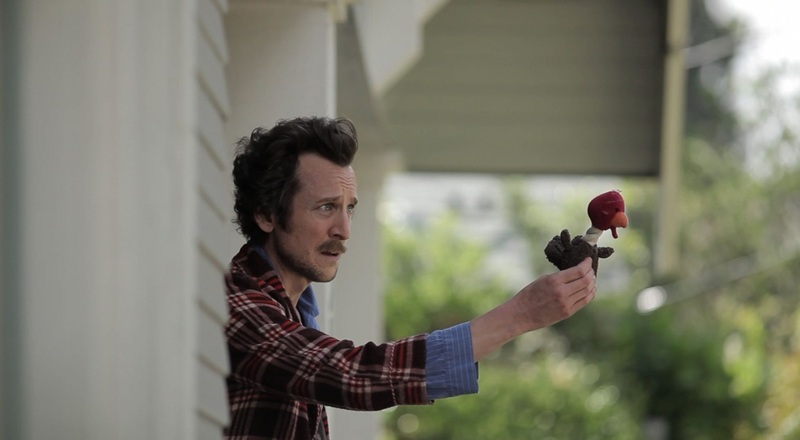 Dolph Springer (Jack Plotnick) wakes one morning to find his dog, Paul, missing. Unable to find him, Dolph tries to go about his normal routine. Throughout the day he runs into his gardener who tries to explain why Dolph’s palm tree has spontaneously turned into a pine tree. Dolph also goes to work for a few hours at a job where the emergency sprinkler system continually runs, pouring down constant water everywhere while he tries to work. It’s not until Dolph is contacted by Master Chang (William Fichtner) that Dolph understands what’s happened to Paul. From the very beginning, watching a van burn while firemen stand around idly by a fire truck while yet another fireman has a bowel movement nearby, Wrong defies comprehension. Later, audiences are treated to ironic alarm clocks, characters that seemingly come back from the dead, and an impossible work environment. Less absurd are the eccentric characters that populate the film, like Dolph’s neighbor, Mike (Regan Burns), who refuses to admit he likes to jog. There’s also Emma (Alexis Dziena), who works at the local pizza restaurant and indulges Dolph’s concerns about the restaurant’s logo. It’s definitely an odd world that writer/director Quentin Dupieux has created; one that’s not meant to be understood necessarily, but instead simply experienced. In many ways, Wrong is a simple film, and that translates to the visuals as well. Yet the cinematography is never uninteresting; in fact, there’s a beauty in the simplicity. The camera’s presence is strong throughout, pulling focus on what’s necessary in deliberate ways, creating a sometimes surreal environment. Those looking for a traditional movie experience will be sorely disappointed. There’s no tangible sense of story structure. Moreover, Dolph is a weak protagonist; he’s continually acted upon by the story rather than the other way around. Even the absurdity strains its entertainment value, rendering the majority of the film as a kind of nonsense that viewers can’t hope to expect anything that happens. Yet, amazingly, Wrong comes together in the end in a satisfying manner. It won’t matter that a character came back from the dead or that a portion of what viewers just watched never really happened. For audiences that can appreciate this kind of film it will be enough that the main plot is resolved intelligibly. For the rest, Wrong is a challenge, but it’s a good first step toward building an appreciation for absurdist humor and Dupieux’s work in particular.